Butter Tarts are a classic Canadian sweet treat. While this recipe uses pecans, feel free to use other additions in place of the pecans such as raisins, walnut pieces or leave the butter tarts plain. 1. Stir the flour, sugar and salt to combine in a bowl or using a stand mixer fitted with the paddle attachment. Cut in the butter by hand with a pastry cutter or on low speed until just small pieces of butter are visible and the mixture as a whole just begins to take on a pale yellow colour (indicating that the butter has been worked in sufficiently). 2. Stir the water and lemon juice together and add this to the dough all at once, mixing until the dough just comes together. Shape the dough into 2 discs, wrap and chill for at least 2 hours before rolling. Alternatively, the dough can be frozen for up to 3 months and thawed in the fridge before rolling. 3. Shape into 2 logs and chill. 1. Preheat the oven to 400 F and lightly grease a 12-cup muffin tin. Pull the chilled dough from the fridge 20 minutes before rolling. 2. Cut each of the logs of chilled pie dough into 6 pieces. Roll each piece out on a lightly floured work surface to just under a ¼-inch thick and use a 4 ½ inch round cookie cutter to cut each into a circle. Line each muffin cup with the pastry so that it comes about ½-inch higher than the muffin tin, and chill the lined tin while preparing the filling. 3. Melt the butter and brown sugar in a saucepot over medium heat, stirring until the mixture is bubbling. Remove the pot from the heat. 4. In a separate bowl, whisk the eggs with the maple syrup, lemon juice, vanilla and salt and slowly pour in the hot sugar mixture while whisking constantly until incorporated. 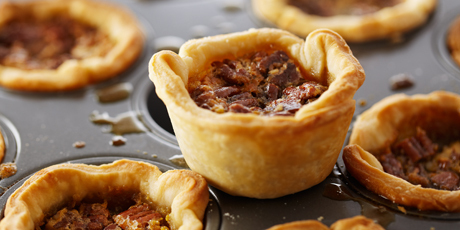 Sprinkle a few pecan pieces into the bottom of each tart shells and ladle or pour the filling into each shell. 5. Bake the tarts for 10 minutes at 400 F, then reduce the oven temperature to 375 F and bake for an additional 10-15 minutes, until the filling is bubbling and the crust edges have browned. Cool the tarts in the tin and after about 5 minutes, carefully twist them around in the pan to prevent sticking and keep them in the pan until completely cooled. 6. The butter tarts should be stored refrigerated but are best served at room temperature. The tarts can be stored chilled for up to 3 days. Pie Dough: This recipe is designed for pies that have a wet filling, such as pumpkin, coconut cream, butter tarts and other such pies. You can make a half recipe if you just need a single crust.